Neocon v. neocon on Iran. In the weeks after September 11, 2001, Clifford May, a former journalist and Republican National Committee official, launched a new think tank called the Foundation for the Defense of Democracies (FDD). Unlike the American Enterprise Institute (AEI) or other Washington bastions of chin-tugging wonks, FDD devotes itself almost exclusively to Topic A: international terrorism. While FDD has a smattering of Democrats like Chuck Schumer on its board, its approach announces its ideological allegiances. The group strongly advocates liberal democracy, aggressively promoted by the United States, as the antidote to Middle Eastern terrorism. That is, the group trumpets the Bush doctrine. The Bush doctrine, and its neoconservative supporters, have always had one indisputable virtue: clarity, marked by crystalline goals and a coherent playbook. This clarity gave them an enormous rhetorical advantage in making the case for war in Iraq, a case that May and FDD helped articulate. Now, Iran has forced itself to the fore of the foreign policy agenda with its furtive pursuit of nuclear weapons and often dismissive attitude toward the diplomats trying to keep the country in the nonproliferation shed. By all measures, the Bush doctrine should fit snugly onto Iran—the world’s leading state sponsor of terrorism on a quest for weapons of mass destruction, a country where the masses demonstrably yearn to breathe free. But, when I called May to learn his policy prescription for Iran, he provided a surprising answer, one that I soon found echoed that of many other Bush doctrine adherents. “I’ve got no sense of where this should ultimately go. Everybody is studying this, but I’m honestly trying to understand this myself and come up with my position,” he told me. “This is complicated stuff.” Not at all what we’ve come to expect from the neocons. In part, the lack of neocon consensus can be attributed to the nature of the problem. Nobody—not the Council on Foreign Relations, not John Kerry’s brain trust—has designed a plausible policy to walk Iran back from the nuclear brink. Or, as Kenneth M. Pollack concludes in his new book, The Persian Puzzle, this is a “problem from Hell” with no good solution. But the muted, muddled response of neocons is also indicative of a deep divide within the doctrine. Over the last four years, no entry in the political dictionary has been as overused and abused as “neoconservative.” On editorial pages and blogs, the term’s definition has stretched to indiscriminately include pretty much every believer in a hawkish foreign policy. But, just because the term has suffered these distortions doesn’t mean that it should be discarded. It describes a distinct subset of the right. During the 1990s, a group of out-of-power intellectuals gathered in a cluster of Washington institutions—think tanks like AEI, magazines like the Standard—where they produced articles and anthologies proposing a new post-cold-war course for U.S. foreign policy, a course that included regime change in Iraq, a tougher attitude toward China, opposition to the emerging international legal system, and, above all, a more robust deployment of U.S. power. They weren’t battling just the Clintonites’ liberal internationalism, but also devotees of Pat Buchanan’s isolationism and Brent Scowcroft’s realism. Many denizens of these institutions proudly identified themselves as neoconservative. All their apparent agreement on the great issues of the day, however, obscured important internal disagreements and inconsistencies. The neoconservative mind has always had two lobes. One side drives neocons toward idealistic language about America’s ability to spread human rights and democracy. 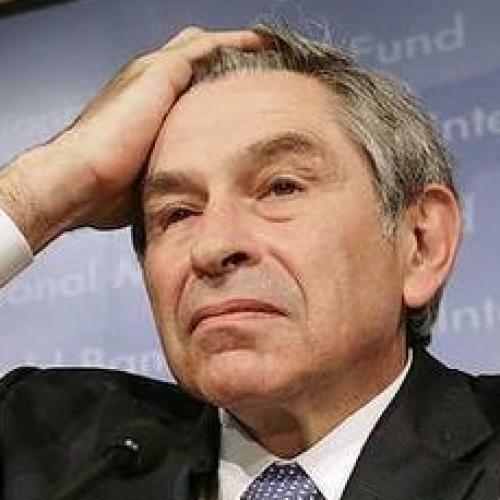 This is the half that dominates the thinking of Deputy Secretary of Defense Paul Wolfowitz and the president’s senior Middle East adviser, Elliot Abrams. In a speech to the National Endowment for Democracy in 2003, President Bush provided the locus classicus of this strain when he announced his “forward strategy of freedom in the Middle East” and called for a “global democratic revolution.” The colder, more analytic lobe of the neocon brain endorses all this talk about democracy. But it couches these goals in a more realist context. It doesn’t want democracy planted out of altruism. It wants democracy planted when it can promote U.S. interests. Charles Krauthammer and Jeanne Kirkpatrick have been the most prominent spokespeople for this lobe. Many of these neocons, such as Krauthammer, scoffed at the Balkan interventions as social work. And they don’t mind temporary alliances with dictatorships and nasty regimes. “We often need such dictators to win the larger struggle against a global threat to liberty,” Krauthammer wrote two years ago in Time, defending the U.S. partnership with Pakistani President Pervez Musharraf. If you were to peer into the minds—or at least the writings—of most rank- and-file neocons, you’d find that the idealist and realist sides co-exist in almost equal proportion. Iran, however, brings these two lobes into conflict. Each policy option that might promote democracy comes at the expense of neocon goals for U.S. security. Each policy that might promote security comes at the expense of their liberal concerns. Iraq, it turns out, was not the first in a series of bold ventures toward a new Pax Americana, as both neoconservatives and their detractors imagined, but an anomaly—a freak instance in which events conspired to produce the clarity that could temporarily bridge the two halves of the neocon brain. In Iran, no policy can bring the neocons’ competing goals into concert. The result is the current paralysis, a moment of indecision that exposes limits of neoconservatism. ON PAPER, OF course, neocons have been far from muddled in their pronouncements about Iran. In January 2002, Bush famously placed the country in the axis of evil. The following year, neocons celebrated the U.S. victory in Iraq by issuing ominous warnings to the mullahs in Tehran. William Kristol, editor of the The Weekly Standard, announced, “The next great battle—not, we hope, a military battle—will be for Iran.” A Standard essay by Max Boot, author of The Savage Wars of Peace, outlined a course the Iranians could follow “to avoid a visit from the 3rd Infantry Division”—a few basic steps that included quitting their pursuit of weapons of mass destruction. In practice, however, the Bush administration shunned such sentiments. First in Afghanistan, then in Iraq, the U.S. government quietly courted the Iranians, trying to ensure that the mullahs didn’t muck up its strategic objectives in Central Asia and the Middle East. Top American officials rewarded this cooperation with public praise. Describing Iran’s role in the Afghan war, Richard Haass, then-director of the State Department policy planning staff, declared in 2001, “By and large, the Iranian role diplomatically has been quite constructive.” And, in 2003, the United States acceded to Iranian demands and shut down the Washington office representing the political arm of the Mujahedin- e Khalq (MEK), an armed Marxist Islamist group that has long tormented the mullahs. With American words and deeds so badly out of sync, the United States missed an unprecedented opportunity to steer events in Iran. “I’ve never seen the [Tehran] regime as vulnerable as before the Iraq war,” says the Hoover Institution’s Abbas Milani, “and never seen it as consolidated as today.” The regime suffered through bursts of protest in 2002 and 2003. At the same time that it faced opposition in the street, the regime faced a far milder brand of opposition in the Majilis, the parliament, where a reformist movement had flourished since Mohammad Reza Khatami took over the presidency in 1997. But, this January, the mullahs set about eviscerating this movement. A month before the Majilis elections, they disqualified about 2,500 candidates and barred 87 sitting members of parliament, including Khatami’s brother, from seeking reelection. At the same time, the regime worked to shore up its future with another bold maneuver. Using revenue from high oil prices and digesting knowledge bought off the Pakistanis, it sped up its nuclear program. But neocons haven’t rallied around this regime-change recipe for a reason. While it satisfies the idealistic half of the neocon brain, it leaves the other half nervous and wanting. Above all, many neocons believe that promoting regime change will not stop Iran from getting the bomb. For starters, very few of them share Ledeen’s assessment of the regime’s health. AEI’s Reuel Marc Gerecht, a former CIA specialist, told me, “The Iranian clerical regime has deep roots.” Or, as Gary Schmitt of the Project for the New American Century bluntly states, “You’re confronted by the fact that the reformers and democrats are stuffed.” Then there’s the disheartening fact that the U.S. government has no obvious democratic opposition groups on which to shower money and support. While neocons unanimously want greater funding for Los Angeles-based TV networks that beam into Iran, they bemoan the paucity of other options. “There’s nothing like the Iraqi National Congress to unite people behind and fund,” one Iran hawk laments. Even if regime change were possible, what happens if it doesn’t transpire quickly enough? If the mullahs are able to build nuclear weapons, they will be able to buy themselves an even longer lease on life. Gerecht points out that Iranians have openly contrasted the fates of Kim Jong Il and Saddam, their cohorts in the axis of evil. They have noticed that the dictator with the bomb escaped unscathed, living comfortably behind a nuclear cordon sanitaire. What’s more, the mullahs have hinted that they have big plans for their nuclear- protected regime. Sirus Naseri, a trusted regime official who negotiated last month’s deal with the Europeans to suspend Iran’s uranium-enrichment activities, has said, “We face a crisis. Once we get over this crisis, we can resume what we were hoping to do.” Some analysts have found ominous overtones in this cryptic message. With the confidence that it can deter U.S. interference, the mullahs could un-self-consciously finish the job of eliminating their domestic opposition once and for all. Finally, though neocons argue that democratic regimes are less dangerous, in Iran, the democrats may be just as determined in their pursuit of the bomb as the mullahs. Aside from the MEK, which has been frequently compared to a cult, very few of the regime’s opponents have openly criticized the nuclear program. “You have a failure of the opposition to engage the nuclear question,” bemoans Hoover’s Milani. In fact, even longtime opponents of the regime have defended Tehran’s atomic ambitions. Ardeshir Zahedi, who served as a foreign minister under the Shah, argued earlier this year in The Wall Street Journal that there’s nothing inherently wrong with an Iranian bomb: “A peaceful Iran with no ambitions to export an ideology or seek regional hegemony would be no more threatening than Britain, which also has a nuclear arsenal.” And some longtime advocates of republican government in Iran have gone so far as to applaud the mullahs for protecting the country’s sovereign right to develop a nuclear program. That’s not to say that a democratic regime wouldn’t be far more susceptible to diplomatic prodding than the less-than-rational theocrats. But the fact that the regime’s hardened opponents have their own nuclear hopes makes regime change a less attractive solution to the current crisis—further contributing to the policy’s paucity of support, even among the neocons who have waxed most Jeffersonian about the virtues of liberal democracy. Even if a preemptive strike delivered the advertised security benefits, it would still harm the American vision for a democratic Middle East. Unlike Osirak, strikes against Iranian facilities would be far from clinical. The Iranians have reportedly submerged their nuclear workshops in densely populated areas like metropolitan Tehran, locales that guarantee civilian carnage. This carnage might be worth the price, except that it would likely cause the Iranian people to rally nationalistically around the mullahs, further postponing the regime’s collapse. “We’d drive all those wonderful students and reformers and disgruntled clergy who are so ready to challenge the government into the mullahs’ arms,” Woolsey argues. Even supporters of strikes concede this backlash will occur. They just doubt that it will be long-lasting. Gerecht says, “You belittle the opposition by assuming that they will disappear. The constitutional movement goes back nearly a century. It will survive just fine.” But, as critics of strikes counter, Iranian nationalism goes back further still. And, even in the current pro-Western climate, without bombs falling on their country, Iranian politicians occasionally squeeze considerable mileage out of anti-Americanism. A preemptive strike could inadvertently undermine an even more profound neocon objective. “Iraq provides an ideal theater for Iran to exact revenge against us,” argues the Council on Foreign Relations’ Ray Takeyh. “They have one hundred thousand targets there.” The Iranians, of course, have an extensive network of proxies and spies in the country. According to an important investigation by Edward T. Pound in U.S. News & World Report, U.S. intelligence believes this network has sponsored Ansar Al Islam, the group that has orchestrated the insurgency and planned terrorist attacks. The Iranians reportedly plotted to assassinate L. Paul Bremer, the former head of the Coalition Provisional Authority, and they issue a $500 bounty for each coalition soldier that insurgents kill. But all this trouble represents only a fraction of the problems the Iranians could cause if they wanted—for instance, in the relatively peaceful Shia south, where they could decisively crush any chance for success in Iraq by forcing the coalition to fight the insurgency on yet another bloody front. In other words, a preemptive strike against Iran would likely trigger a chain of events that would doom neoconservatism’s grandest experiment. TO BE SURE, the neocons have rallied around one policy prescription: They want Iran’s nuclear transgressions referred to the U.N. Security Council, where the United States can push the international community to collectively punish the mullahs. But that’s not much of a solution, either. The United States can be reasonably sure that Russia and China will veto any sanctions against Iran. But this stopgap proposal is itself revealing. It is neocons who have pushed the debate in the direction of the much-loathed United Nations, a course they would only suggest in a state of confusion. And there’s no surer sign that neoconservatism has been chastened than the manner in which neocons describe themselves when discussing Iran. Where many of them once unabashedly self-identified as members of an intellectual movement, they now deny that such a movement ever existed. They refer to neoconservatism in quotation marks, as if the term were merely a concoction of overactive left- wing imaginations. David Frum, a former Bush speechwriter, told me, “This really is an example of what academics call essentialism. Hostile critics invent this thing called neoconservatism that unfailingly favors unilateral military force. But, when the so-called ‘neoconservatives’ examine Iran and don’t advocate the use of unilateral military force, the critics feel like a dirty trick has been played upon them.” Denial may be the first step on the path to recovery. Franklin Foer was the Editor of The New Republic. This article appeared in the December 20, 2004, issue of the magazine.